This is wonderful tumbled Quantum-Quattro Silica, 0.2 oz and 1.25" by 0.6" by 0.3" and is a combination of rich, turquoise chrysocolla, lovely green malachite, forest green dioptase, and royal blue shattuckite, all with a side of smoky quartz. As with Melody Stone, not all have to be visible as all combinations share the energy. 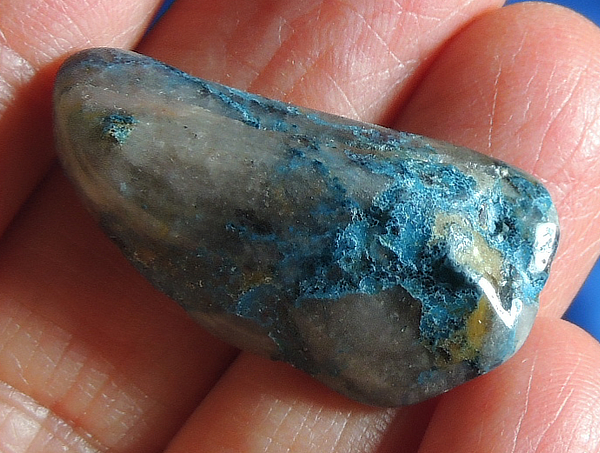 This one is predominantly blues with a teeny touch of dioptase and mo malachite that I can see. Still, her colors will absolutely amaze you as you stare at the eye-popping display. She comes from Namibia, ready for your pocket or medicine pouch. This stone works to align all of the energy bodies and Chakras. As you sit with her, she brings about a sense of peace, contentment, protection and relaxation. She helps you reset that stress-ometer, allowing you to see things in a whole different light. Keep in a pocket or medicine pouch – I like to keep one in the car to help deal with the stress of traffic. Tuck her under the pillow for sweet and peaceful dreams. She is a welcome Spirit who enhances your sense of well-being on all levels.